Made of 600 denier Steeltex Rip-Stop nylon, the new Ozark Turnout Blanket is designed with a water-proof coating to stand up to the harshest winter conditions. When the temperature rises, the breathable fabric allows your horse to stay dry and comfortable. 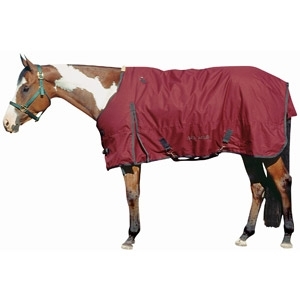 The blanket enables freedom of motion and features a soft nylon coat polishing liner with criss-cross belly straps and hidden rear leg straps.